“When we first on-boarded a donor called the Central Co-op, they allowed us to take as much food as we wanted on Saturdays. So, the first time we picked up from them, we took 500 lbs. of produce — some of the best produce I’ve ever seen… I mean the Washington grown, local, organic stuff,” said Seattle Food Rescue volunteer Tim Jenkins, describing one of his favorite pick-up memories. A CU alum and past Boulder Food Rescue volunteer, Tim Jenkins helped start Seattle Food Rescue after moving to the city. Nowadays, when he is not working as an operational manager for a start-up e-commerce company, he helps coordinate Seattle Food Rescue’s activities. “I don’t really consider myself an Executive Director. I do much more organizing than executive directing, so I just tell people to organize. I am the Executive Director in terms of finance and liability because I am currently the only person running shifts year round,” said Jenkins. 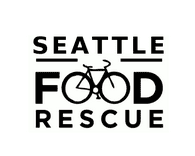 Seattle Food Rescue was created in 2014 by its founders, Helen Katich, Laura Biren, and Tim Jenkins. Like Boulder Food Rescue, Seattle Food Rescue works with food banks like the Pike Market Food Bank and University District Food Bank, picking up produce from smaller donors that would otherwise be missed by larger redistribution organizations. The organization reached its 20,000lb mark for amount of food rescued this March. However, differing from other food rescue chapters, Jenkins states that Seattle Food Rescue features a rather decentralized structure. There are no fundraising campaigns, official coordinators or paid staff; SFR acquires the majority of the materials it needs from in-kind donations and purchases made by volunteers. For its people power, SFR draws the majority of its volunteers from local universities. 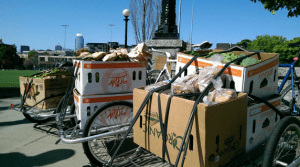 Apart from the rain and hilly terrain, a key feature of Seattle Food Rescue is its strong relationship to the University of Washington and Seattle University. Jenkins estimates that 90% of SFR’s volunteers are students, expressing that their flexible schedules accommodate well with pick-up schedules. Ideally, within the next year, Seattle Food Rescue hopes to start a service-learning program at one of these local universities. In addition to developing program partnerships, a broader goal of the nonprofit is to increase their educational component. “We want to raise awareness about food waste as global issue as well as raising awareness about the value of having a nutritious meal every day,” said Jenkins. Like other food rescue chapters, Seattle Food Rescue faces the challenge of finding their redistribution niche in the city. South Seattle is considered a one of the nation’s largest food deserts and various organizations have established a network to address food insecurity. Jenkins expressed that the core mission of SFR is to collaborate with other food redistribution organizations in order to in fill in the gaps of the current system. 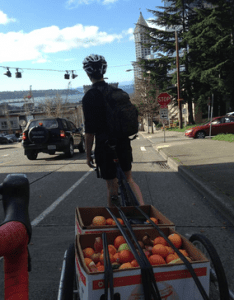 “It’s really about finding our niche in Seattle…SFR is working to ensure that we’re making it [food redistribution] a little bit better than it currently is by revising routes to make it a little more bike-friendly” said Jenkins. Tim also said that SFR has yet to completely discover their niche in Seattle’s different communities. Rather, this process of finding their role will take time, experience, and constant adjustment. In regard to Seattle Food Rescue’s future aspirations, Jenkins said that he is excited for the organization to strengthen its relationships with local schools and food redistribution nonprofits, as well as expand their donor and volunteer base. Similar to the current need of Hole Food Rescue in Wyoming, Jenkins hopes to increase SFR’s amount of volunteers and simultaneously create a more consistent base for all the seasons. “Near future plans are to raise stipends for part-time service scholarships to help carry us through the summer. We are getting to the point where sustained growth is probably going to depend on a consistent volunteer base year round,” said Jenkins. Tim also highlighted another goal for Seattle Food Rescue is to increase its collaboration with the Food Rescue Alliance (FRA). 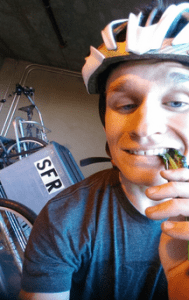 The Food Rescue Alliance is a branch organization of Boulder Food Rescue that provides guidance and organizational support to other organizations adopting the bike-powered direct redistribution model. One of the founders of Seattle Food Rescue, Helen Katich, currently serves as a coordinator for the Food Rescue Alliance. Katich provides support for other rescues and is currently facilitating the creation of the FRA’s peer learning network. This online network will serve as an avenue for other food rescues to learn from one another about the skills, challenges, and best practices of running a food rescue. For more information about Seattle Food Rescue, please visit their website or Facebook page.